Retention ponds are a type of green/blue infrastructure that feature a permanently wet area of water (i.e. ponds), designed to store water and provide attenuation and treatment, supporting aquatic and emergent vegetation. They empty into a receiving water body. Retention ponds work similar to wetlands but can store more water. Phytoplankton in the water body absorbs soluble pollutants, and sedimentation removes solids from the water column. Water bodies encourage low intensity activities and the areas around ponds can be designed to offer space for recreational activities. Provide peak discharge control for small and medium storms (10 yr return period) or even large storms if carefully designed. Performance depends on storage volume permitted. Volume reduction depends on infiltration and storage time. By storing water and attenuating peak flow, retention ponds can positively influence the risk of flooding downstream. Water bodies can balance temperatures and mitigate the UHI effect. Vegetation can take up CO2 that can consequently be buried, but Methane and other GHG can also be released. Ponds can harbour wildlife and aquatic vegetation and also function as habitat corridors and stepping stones for wildlife. They perform an ecologically highly important function, especially in the urban environment. Ponds can potentially release water during dry periods, and the possibility to re-use water can reduce pressure on mains water. Avg sediment removal efficiency of 90%, N 30%, P 50%, metals 50-80%. Depends on the retention time provided by the pond. Ponds are an aesthetically pleasing landscape feature, providing a sense of beauty and so promoting wellbeing. Water bodies have been shown to provide opportunity for reflection and social interaction and so are important cultural points if maintained and designed adequately. Can be used as educational facilities. Can add significant property value to development and increase business and tourism. 150% increase in property value in residential area where view of the water is available. Through their impact on reducing and removing surface water runoff, retention basins can reduce severity of surface water floods. Ponds provide infiltration and storage, and are most effectively used lower in the ‘catchment’, after water reaching the pond has already gone through pretreatment. They can, however, provide primary, secondary and tertiary treatment. The retention time of permanent water is linked to the effectiveness of pollutant treatment, and the volume of the storage area to its capacity for holding floods. It is not recommended that runoff is directly discharged into ponds. 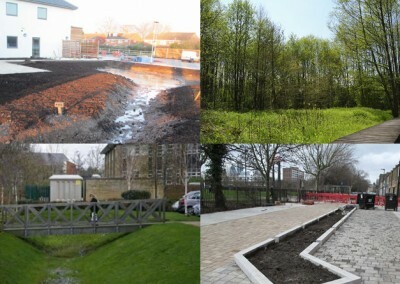 To provide a comprehensive treatment and management of surface water, trees should be seen within the wider landscape. While they are able to intercept rainfall before it becomes runoff, it is important to understand that their ability to take up existing runoff and infiltrate it is limited. In close proximity to watercourses, they can slow the flow and so influence the extent of flooding. Especially where large quantities of surface runoff are expected, for example where large impermeable areas are located upstream, trees should be complemented with additional interventions. They can be combined with raingardens that are planted in their pits or amenity lawns or detention basins that can take up additional water (options for realising these combinations can be found not only in private gardens and parks but also roadside verges or other small areas. Water can further be lead into retention ponds or wetlands to undergo additional treatment or to be stored over a longer period. 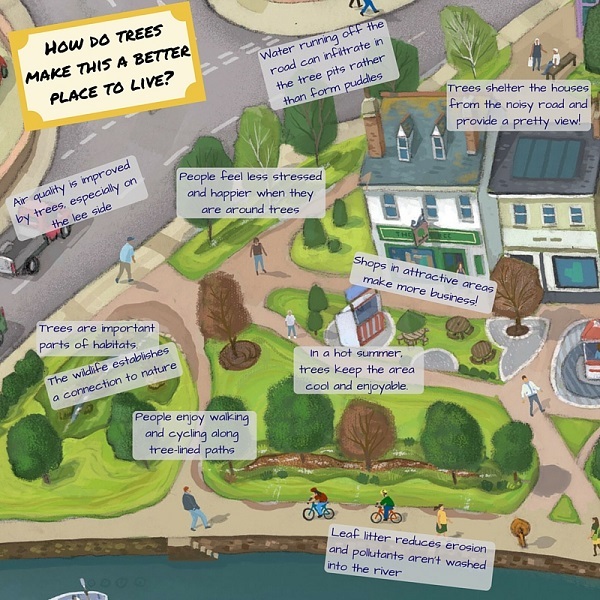 Below, you see some of the multitude of additional benefits that trees provide in the context of the urban landscape. £15-25/m3 treated water (low-medium). Depends on site context – sometimes existing natural depressions can be used. Typically high land take (>5ha), but can be designed to be smaller. Long design life (20-50 yrs). Commercial and Residential, Retrofit/high density area unlikely due to high land take. Liner enables installation above vulnerable groundwater. If groundwater table is high, a liner could also improve sedimentation by preventing constant inflow into the pond. Continuous water supply must be given to ensure permanent pool does not dry out. 0.5-1£/m2 surface area. Litter and debris removal, sediment removal may be required. Vegetation management. Outlets and inlets need to be kept free. If sediment is not removed sufficiently before entering the pond, dredging may be necessary, reducing design life and increasing costs. Bodies of standing and running water (excluding marshes/swamps) have been shown to provide more mental health and aesthetic benefits than built urban environment without water and even in greenspaces, those featuring water are ranked as being more interesting and restorative. Depending on the water quality, water from ponds can be reused for watering greenspaces or other non-potable uses. Eutrophication in summer. Avoid by providing constant baseflow, prevent runoff of water directly from fertilised areas around pond (e.g. lawns). It is important to provide an initial stage of water treatment (e.g. traps, filter strips, sediment forebays) before runoff is discharged into ponds. If all surrounding area managed intensively, the ecological potential of the intervention sinks. On the other hand, if vegetation is not managed at all, the area may have low potential for recreational activities. It is therefore important to assign different areas for different functions. Invasive species can be problematic. Standing bodies of water can emit greenhouse gases like methane, having a negative impact on the climate. Ashley, R. M., Nowell, R., Gersonius, B. and Walker, L. (2011) ‘Surface Water Management and Urban Green Infrastructure’, 44(0), pp. 1–76. Berwick, N. and Wade, D. R. (2013) A Critical Review of Urban Diffuse Pollution Control : Methodologies to Identify Sources , Pathways and Mitigation Measures with Multiple Benefits. 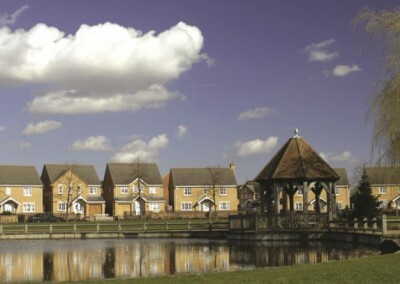 Environment Agency (2015) Cost estimation for SUDS – summary of evidence. Bristol. Kellagher, R., Martin, P., Jefferies, C., Bray, R., Shaffer, P., Wallingford, H. R., Woods-Ballard, B., Woods Ballard, B. (2015) The SUDS manual, CIRIA. London. Pratt, C. J. (2004) Sustainable Drainage. A Review of Published Material on the Performance of Various SUDS Components. Bristol. Forest Research (no date) Improving Air Quality. J B Ellis, R B E Shutes and M D Revitt (2003) Constructed Wetlands and Links with Sustainable Drainage Systems. Bastien, N. R. P., Arthur, S. and McLoughlin, M. J. (2012) ‘Valuing amenity: public perceptions of sustainable drainage systems ponds’, Water and Environment Journal, 26(1), pp. 19–29. Charlesworth, S. M. (2010) ‘A review of the adaptation and mitigation of global climate change using sustainable drainage in cities’, Journal of Water and Climate Change. IWA Publishing, 1(3), p. 165. Charlesworth, S. M., Harker, E. and Rickard, S. (2003) ‘A Review of Sustainable Drainage Systems (SuDS): A Soft Option for Hard Drainage Questions?’, Geography, 88(2), pp. 99–107. Comings, K. J., Booth, D. B. and Horner, R. R. (2000) ‘Storm Water Pollutant Removal by Two Wet Ponds in Bellevue, Washington’, Journal of Environmental Engineering. American Society of Civil Engineers, 126(4), pp. 321–330. 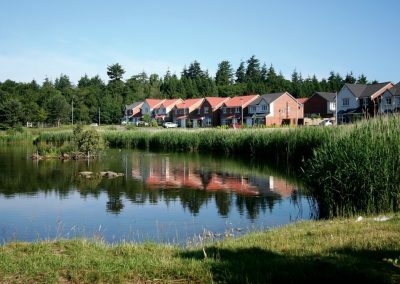 Heal, K. (2000) SUDS Ponds in Scotland – Performance Outcomes to Date. Moore, T. L. C. and Hunt, W. F. (2012) ‘Ecosystem service provision by stormwater wetlands and ponds – a means for evaluation?’, Water research, 46(20), pp. 6811–23. Persson, J., Somes, N. L. G. and Wong, T. H. F. (1999) ‘Hydraulics Efficiency of Constructed Wetlands and Ponds’, Water Science and Technology. IWA Publishing, 40(3), pp. 291–300. Persson, J. and Wittgren, H. B. (2003) ‘How hydrological and hydraulic conditions affect performance of ponds’, Ecological Engineering, 21(4-5), pp. 259–269. 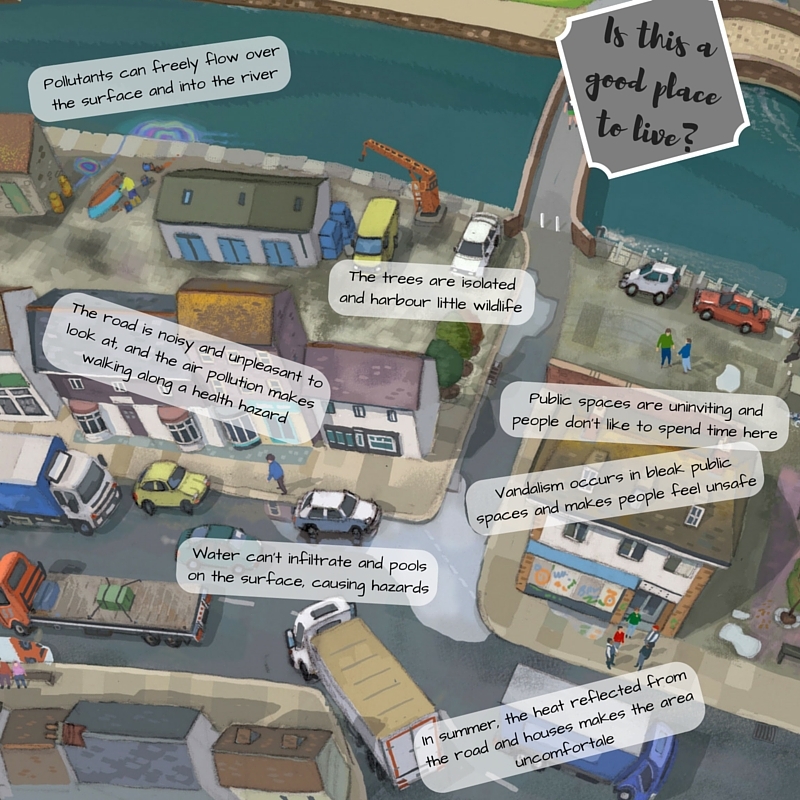 Sniffer (2004) SUDS in Scotland – The Monitoring Programme. S. Environmental Protection Agency (2009) Stormwater Wet Pond and Wetland Management Guidebook. 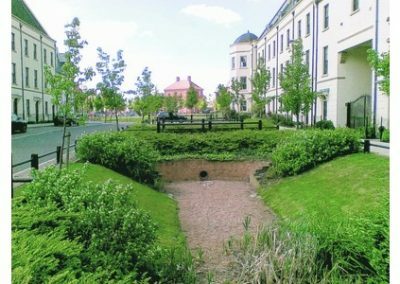 Villarreal, E. L., Semadeni-Davies, A. and Bengtsson, L. (2004) ‘Inner city stormwater control using a combination of best management practices’, Ecological Engineering, 22(4-5), pp. 279–298. Völker, S. and Kistemann, T. (2013) ‘“I’m always entirely happy when I’m here!” Urban blue enhancing human health and well-being in Cologne and Düsseldorf, Germany.’, Social science & medicine (1982), 78, pp. 113–24. Völker, S. and Kistemann, T. (2015) ‘Developing the urban blue: Comparative health responses to blue and green urban open spaces in Germany’, Health & Place, 35, pp. 196–205. White, M., Smith, A., Humphryes, K., Pahl, S., Snelling, D. and Depledge, M. (2010) ‘Blue space: The importance of water for preference, affect, and restorativeness ratings of natural and built scenes’, Journal of Environmental Psychology, 30(4), pp. 482–493. Wong, T., Breen, P. and Somes, N. (1999) ‘Ponds vs Wetlands – Performance Considerations in Stormwater Quality Management’, in Comprehensive Stormwater and Aquatic Ecosystems Management. Auckland, pp. 223–231.